You may have noticed that activity at the Carolina Soul blog has slowed down these past several months. 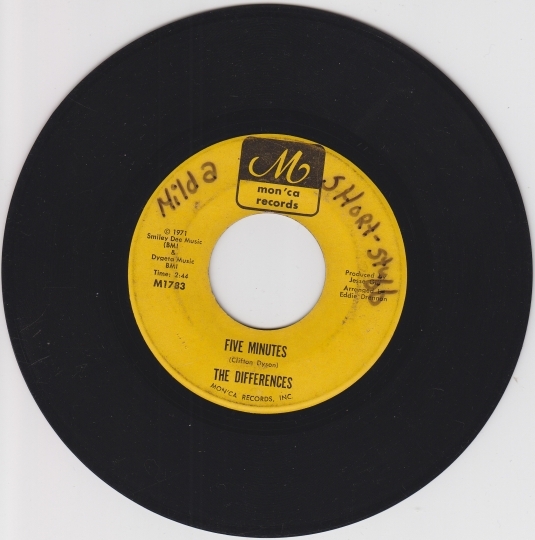 One big reason has been our involvement in a new local humanities project focusing on Durham, NC’s rich heritage of soul, funk, and R&B music. Dubbed the Bull City Soul Revival, this collaborative effort has resulted in a concert, a series of discussions, and an exhibit, the latter of which we were a part of. We are pleased to announce that the exhibit opens on Thursday, April 19th at the Hayti Heritage Center in Durham; more details are here. Above is a sneak peak from the exhibit, which is called “Soul Souvenirs: Durham’s Musical Memories from the 1960s and 1970s” and which was co-curated by Joshua Clark Davis and Jason Perlmutter and designed by Lincoln Hancock and Robin Vuchnich. 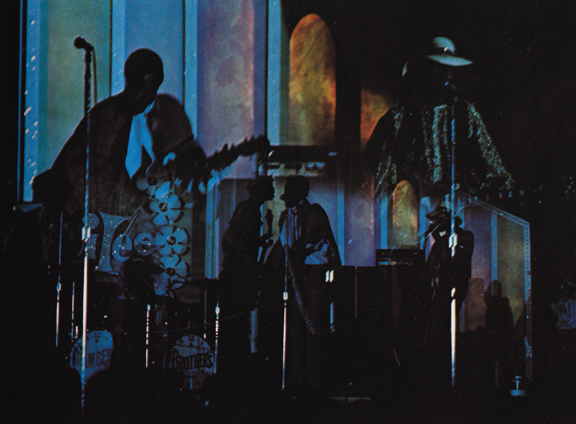 The “Soul Souvenirs” narrative touches upon origins, influences, politics, history, venues and other related businesses, radio and other media, and of course music and musicians. On the walls of the Hayti’s second floor gallery space, we have featured images and history of several Durham performers who may be known to Carolina Soul readers through their great vinyl releases: Nick Allen (who recorded for Walas), the Black Experience Band (who have 45s on Duplex, Microtronics, and Tri Oak), Blue Steam (on the Catamount label out of New Jersey), the Communicators (the headliners on two out of three of the Black Experience Band releases), Duralcha (of “Ghetto Funk” fame), the Modulations (Buddah recording artists), NCCU (United Artists stars), Risse (who cut singles for Chocolate Cholly’s), and Johnny White (the creator of some fine soul on Valle-Dalle). To get a taste of a selection of these songs, and more, check out our new mix at SoundCloud. 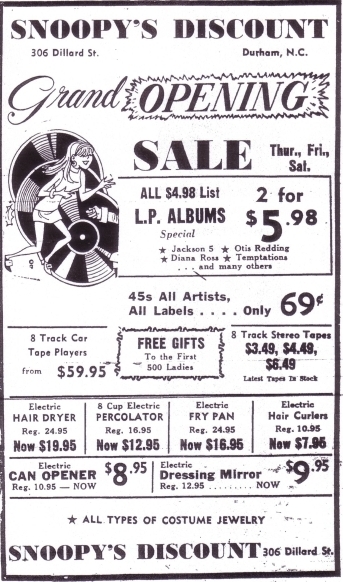 In addition to images of the complete recorded output of the artists mentioned above (as well as all other locals known to have cut 45s or LPs), the exhibit also displays numerous vintage advertisements, newspaper clippings, publicity materials, and other memorabilia. We are excited to say that some crucial last-minute additions came in just today from legendary Durham concert promoter Roosevelt Lipscomb. 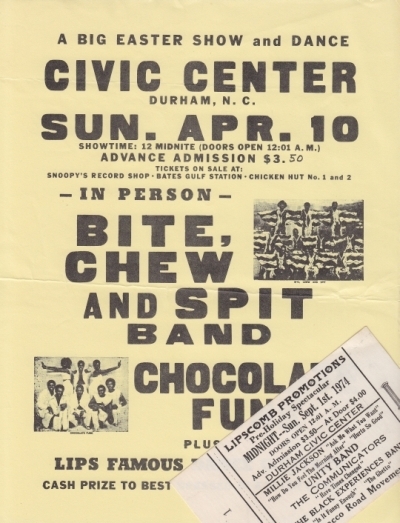 Two are pictured below from shows that Mr. Lipscomb put on at the Durham Civic Center: a flyer for an April 1977 double-bill of Chocolate Funk of Greensboro and Bite, Chew & Spit of Asheville (previously the Innersouls, who cut a great funk 45 on the Plemmons label); and an unused ticket for a fall of ‘74 concert by Millie Jackson, who was joined by the Communicators & Black Experience Band, among other regional talent. Anybody ever heard of the Unity Band or the Tobacco Road Movement? 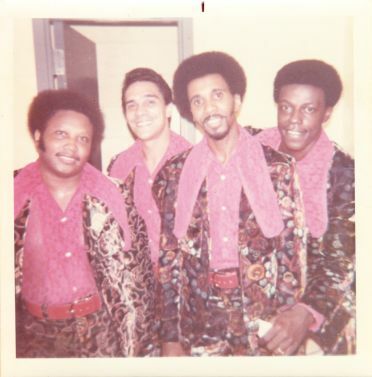 “Bull City Soul Revival” was made possible by funding from Durham Library Foundation and from the North Carolina Humanities Council, a statewide nonprofit and affiliate for the National Endowment for the Humanities. “Records is a market that can be used to brighten the future of lots of black people with jobs and higher prestige all over the country,” Jimmy Liggins announced in 1976 to the readers of the Carolina Times, Durham, North Carolina’s most prominent African American newspaper. Liggins, a minor rhythm and blues star of the 1950s, was publicizing his Duplex National Black Gold Record Pool, headquartered in Durham, which sought to “help and assist black people to own and sell the music and talent blacks produce.” With the aid of this “self helping program,” aspiring hit-makers could record and release music that Black Gold sold through mail order and at Liggins’s shop, Snoopy’s Records, in downtown Durham. Kenny Mann (of the band Liquid Pleasure) vividly recalls his frequent trips to Snoopy’s as a teenager in the late 1960s and early 1970s. Liggins “was like a god” to Mann and other young customers who patronized the store. “Everybody knew” Liggins and his two business partners, Henry Bates and Paul Truitt. 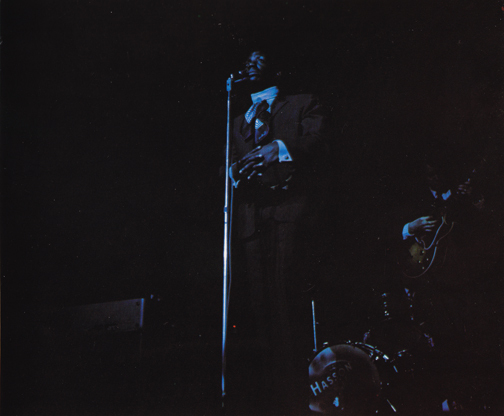 “These guys, I was listening to them talk about bringing Tyrone Davis and Johnny Taylor and Al Green to town . . . It was fun to go [to their store] because it felt like the place to be; there were girls in there, and I was twelve, thirteen years old.” Not only that, but Mann “never felt the pressure to buy something” like he did in stores in his hometown of Chapel Hill, where white shopkeepers frequently followed young African American shoppers around their businesses, suspecting they might shoplift. “They had a double standard,” Mann remembers. Chapel Hill “really was set up as if they didn’t want to do business with us black people.” In sharp contrast, Liggins envisioned Snoopy’s as “our mall”—a “hang out” where black consumers could buy black music in a record store owned and operated by African Americans. Black-owned record stores like Snoopy’s represented a crucial nexus where African American enterprise, consumer culture, community, and of course, music all met. 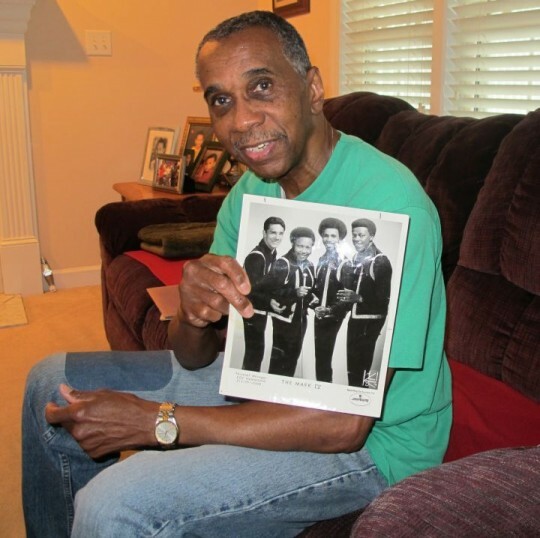 Many more local luminaries figure in the article, such as Curtiss “Curt” Moore, who was previously profiled at Carolina Soul here and here. 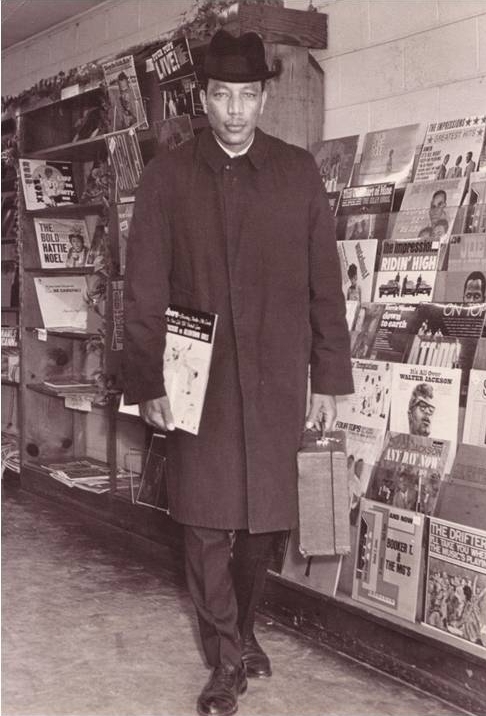 Owner of three Curt’s Records Stores in and around Greensboro from the 1960s through 1980s, Moore is seen below in one of his shops circa 1966. 1) Read the article for free if your college or public library subscribes to the ProjectMuse database. 2) Order a hard copy of the Southern Cultures music issue (holiday gift idea!). 3) Or download the article or the entire Southern Cultures issue for your Kindle or Nook.